One of our favourite meals San choy bau is low carb, simple tasty, fast food. I turboed two chicken thighs to make mince and turboed some leftover cooked pork in the thermomix separately. Soaked a packet of bean thread vermicelli in boiling water for a few minutes Many recipes don’t have this addition but it’s one way to bulk up this dish simply. You could just add more chicken or pork. Chopped and cooked garlic, ginger and spring onion, in the thermomix. Added the chicken and pork meat and cook with sauces to taste; any combo of fish sauce, tamari, soy sauce, oyster sauce, tsp honey works well. Lastly added vegetables and vermicilli. This is such a versatile meal because you can add anything ; carrot, zucchini, capsicums, spinach, shiitake mushrooms, bean sprouts, cucumber, water chestnuts, sesame seeds or nuts. For this meal, julienned carrot and zucchini using a mandolin but they could be easily chopped in the thermomix as per recipe link above. The vegetables when finely sliced need no more than a toss in the sauces. 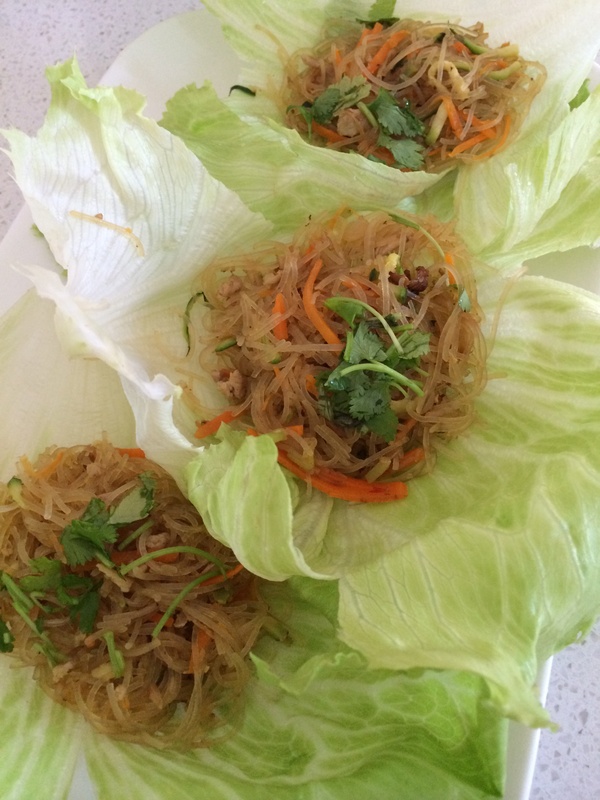 Served all together in lettuce cups topped with coriander and chilli sauce. My kids love eating these cups because it’s relaxed finger food. There’s something fun about heaping the lettuce cups yourself and adding your own herbs, seeds and chilli sauces. A san choy bau closely resembling our recipe from the community is pasted above.